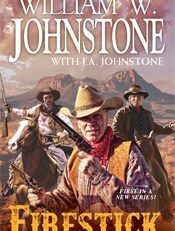 Keeping the peace in a West Texas town like Buffalo Peak should be easy for a legendary frontiersman like Marshal Elwood “Firestick” McQueen. He?s got his longtime buddies “Beartooth” Skinner and “Moosejaw” Hendricks as his deputies?not to mention the famous rifle that earned him his nickname. But when Firestick learns that their ornery old friend ?Rip? Ripley just rode into town, all bets are off. It?s darn near impossible to keep the peace when Rip?s specialty is disturbing it. Firestick finds a decade-old wanted poster for Rip?the reward is one dollar. Firestick uses it to toss Rip into the clink till he decides to leave town. But Ripley?s still up to his old tricks?he has a new gang of cutthroats coming to Buffalo Peak to steal a king?s ransom in gold in the town bank. Firestick, Beartooth, and Moosejaw become pawns in what just might be the heist of the century. Because Rip?s kill-crazy pals will have to bust him out of jail first . . .